I am captivated by the ever-changing colors in the seasonal landscape. Nature’s palette offers a range of wild intensity to subdued tranquility. I am attentive to my surroundings, finding artistic inspiration daily. Creating depth, texture, movement, are the guiding forces in my work. Pure color combined with shape and form allows me to create visual energy on a flat surface. Robin Samiljan grew up on the North Shore of Chicago, attended Vanderbilt University in Nashville where she majored in art history, graduated with a Bachelor of Arts degree in 1979, and eventually moved to the North Shore of Boston in 1988. The regional beauty of the New England landscape immediately captured her attention while she re-created nature’s gifts by way of visual art. As a life-long learner, Samiljan studied watercolor painting with local artist Nordia Kay and Vermont artist Jeanne Carbonetti. 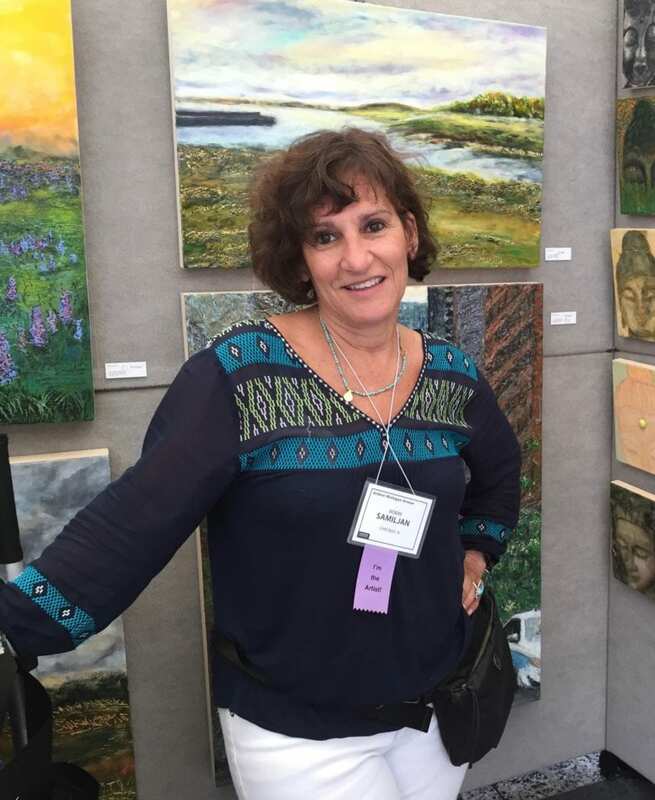 She joined various art organizations, and after several years of participating in the arts community became president of the Swampscott Arts Association. Samiljan transformed the organization during her five-year presidency and was instrumental in developing an online presence to promote the association’s shows and events. She was an active board member at the Marblehead Arts Association and also became head of their art committee. Montserrat College of Art invited her to teach watercolor painting in 2006 as part of the continuing education program, and her classes ran until her move back to Chicago in 2013. Samiljan attended graduate school as a mid-career artist in 2008. It was during the studio residency portion of the Master of Education curriculum at Endicott College when she explored encaustic painting. Her work began to take on new depth in multiple art mediums. She also attended encaustic workshops taught by Tracy Spadafora at the 4th International Encaustic Conference, Laura Moriarty at the Truro Center for the Arts, the "Art and Soul Journey" taught by Kathryn Bevier and Lora Murphy at the Burren College of Art in Ireland, and encaustic collagraph techniques taught by Jeff Hirst in Chicago. Encaustic painting combines beeswax mixed with pigment and resin, melted and applied to a surface that is then fused with heat. Sculptural qualities achieved using wax have become a welcome addition to her impressionistic paintings. Most recently, Samiljan has been painting with alcohol inks, working with the heavily saturated inks on papers, and also combining them with encaustic medium. As a juried artist member of the Copley Society of Art in Boston and an active exhibitor, Samiljan has established a dedicated following. Both Children’s Hospital and Newton-Wellesley Hospital have purchased multiple series of her works for their permanent collections. These paintings contribute to providing the peacefulness and tranquility the hospitals strive to create for their patients and visitors. Twenty-five years later, she has moved back to her home town of Chicago and has found new inspiration developing a patronage in the Midwest and beyond. She is currently teaching at the Evanston Art Center and in Winnetka at the North Shore Art League. Samiljan also maintains representation at the Copley Society of Art in Boston, and can be found exhibiting during warmer months in local, seasonal art festivals. The Copley Society of Art is proud to present Miniature Moments, a solo show of encaustic works by Robin Samiljan. Evanston artist Robin Samiljan’s work will travel all the way to downtown Boston. Local watercolorist Robin Samiljan merges art with poetry in her new work. "Inspiration for 'A Year of the Full Moon' came each month when the moon was full. After viewing the moon I painted the way it made me feel rather than what I actually saw."